Donald Trump serves a vital role for the corporate attacks against public services, especially public education, elderly and disabled people, children with special needs, earned and paid-for pensions, and other sane purposes served by a civilized society. 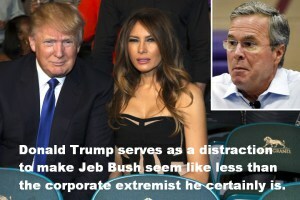 Donald Trump serves as a distraction to make Jeb seem like less than the corporate extremist he certainly is. Jeb condemns lobbyists in spite of his incredible pro-lobbiest history with Florida’s legalized, legislative corruption. Jeb claims that he helps senior citizen voters even after he has cut away at their earned and paid-for benefits and pensions.